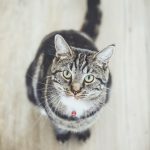 Cats sense cancer: myth or reality? You have probably heard that dogs are trained to be useful when it comes to sensing cancer and other illness in humans. But what about cats? Do they have the same capacities as the dogs? In this article, we will discuss if cats sense cancer or not. Stay with us! Is the spirituality that makes cats sense cancer? We have said here before that cats are amazing animals. Covered with mysticism from the earliest age we have knowledge about their history, cats are very present animals in the esoteric world. Egyptians, Celts, witches and wizards have always seen the cat as a sacred animal. And to this day, many people consider that cats really have an advanced perception. They believe it based on what they see inside a cat’s eyes, if you watch closely: calm, intelligence and a higher level of consciousness. In addition, all who see cats as sacred animals have had other evidence over the years. They truly believe that cats have a connection to the spiritual world and the dead as no other domestic animal has. And by having this path as a freeway, they would be able to sense cancer and other illnesses. In addition to developed spirituality, cats have another factor in their ability to detect things on the physical plane. This factor is a high psychic capacity compared to other animals and there is a name for it: animal psi. According to scholars, animal psi would be the skill set that some animals possess. Such skills include being able to sense the presence of spirits, death and predict the future. But would such skills also be useful for cats sense cancer? Besides the spiritual and psychic characteristics of these animals, would not the physical constitution also be a relevant point? In this question, we count one more score for cats. To begin with, the five senses of these animals are very sharp. We must not forget that long before pets, cats are in essence hunters and these are essential characteristics for all felines. From all the aspects we have discussed, we can conclude that yes, cats can really sense cancer, right? Unfortunately, no. The bad news is that there are not enough studies on the subject. As we said at the beginning of the article, there are already several studies on dogs sensing cancer and other illnesses. For a long time, they have also been helping in prevention and support for people suffering from seizures too, for example. They train dogs to detect all these things from the smell. If so, there are people who say that the smell of cats is even more acute than that of dogs. So why are there no studies and training for cats yet? Having been proven or not, some people have already claimed that their cats do sense cancer. In Canada, a man discovered a huge tumor in his left lung, after his cat touched him incessantly and in exactly the same place on his back. And in Tennessee, a woman also went to the medical care, after her cat jumped every day on one of her breasts. Outcome: breast cancer. Regardless of studies, these owners just have to thank the fantastic skills of their kittens. Why do people say that cats sense spirits?